So excited to try out my new Swiss cutting tools and the new larger (A3) Japanese vinyl plates! As it turned out, I wasn't happy with my first attempt so I ended up cutting these plates twice, I didn't mind because its my favourite part of the process and the Swiss cutting tools are just a dream to use! The Japanese vinyl plates are much stiffer than the easy-cut vinyl I've used before but as they are double the size, this made handling much easier and I could cut very fine lines which are robust. I cut 2 plates, one for the black and another for the grey/green. The surface is blue on one side and green on the other and reveals grey underneath as you cut into it, I like this but I personally would love a black plate revealing a light grey, as I think the cuts would be easier to evaluate? I cut the black plate first and then offset onto the 2nd plate to get an accurate placement for the grey/green, essential really as the registration between these two is very tight and the highlights on the hair are very tricky to place properly. It was my first time trying a tonal roll for the background, I really like it but it took a lot more time and effort than a flat colour. Overall, I'm very happy and have learned so much on this piece! I was delighted to be included in the show this year with my small triptych drawing 'Off Piste & Adrift', which features a beautiful Aran coat knitted for my daughter by my late Mother. I was delighted to be asked to participate in the Droichead Arts Centre's event in celebration of International Women's Day 2017. Myself and six other professional ladies presented a slideshow in the style of 'Pecha Kucha', where we presented 20 slides each with 20 seconds to speak about each slide, on the topic of the female influences on our work and lives! It was great fun and a pleasure to meet these wonderful ladies and learn about the women who have inspired and influenced them. Thank you to Marcella Bannon and Collette Farrell. Nicola Pierce (writer), Grainne Rafferty (actor, writer), Jackie Hudson Lalor (visual artist), Alison Comyn (journalist, broadcaster), Nuala Early (sculptor), Aideen Morrissey (musician), Geraldine Stout (archaeologist). It was with the greatest of pleasure to have sponsored with my working partner, Curator Sinéad Smith, an exhibition of The Maire Ní Rioda Collection, a selection of life drawings and sketches by The Countess Constance Markievicz. The works were exhibited in Drogheda with an opening speech by Carmel Naughton and at The United Arts Club, Dublin, of which she was a founding member, by Conor Brady on June 2nd, 2016. Special thanks to Raphael Hynes and Marie Louise Martin for all their effort and support. 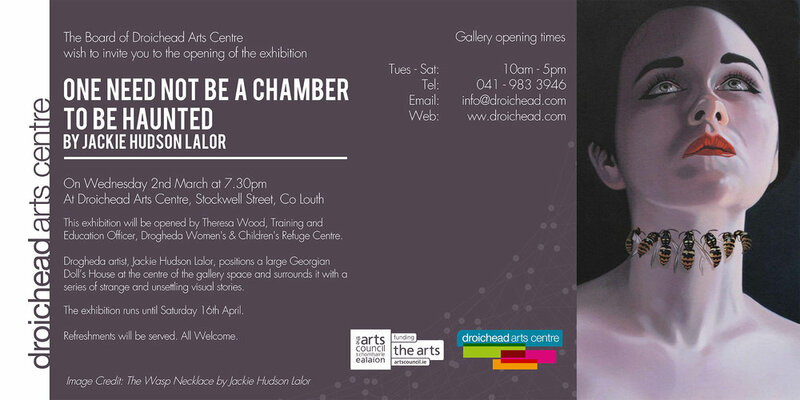 My solo show was a culmination of many years of work and I was delighted to have it at the Droichead Arts Centre, Drogheda. Thank you to all the staff at Droichead who were wonderful to deal with, especially Marcella Bannon, Orla Maloney and Tony Conaghy. Special thanks to Theresa Wood, Training and Education Officer, Drogheda Women's and Children's Refuge Centre for such an amazing opening speech. Thank you to my family and friends, my husband Kevin who is my greatest support every day, Sinéad Smith for mentoring and curation, musician Mathias Baumann, Photographers Andy Spearman and Keith Dixon, my great supports Conchi Garcia, Colin Eyre and indeed all the members of the public who visited and gave such wonderful feedback. My painting 'Expectation Street' was made in response to the title track on Mathias Baumann's album 'Expectations'. Myself and Mathias had previously worked together in the arts collective 'idir' and I was delighted to work with him again. I built the model of the maze as a reference to work from and Mathias filmed me working on the painting to use as a video for the track. It was many months in the making and a very enjoyable experience, I look forward to many more collaborations! 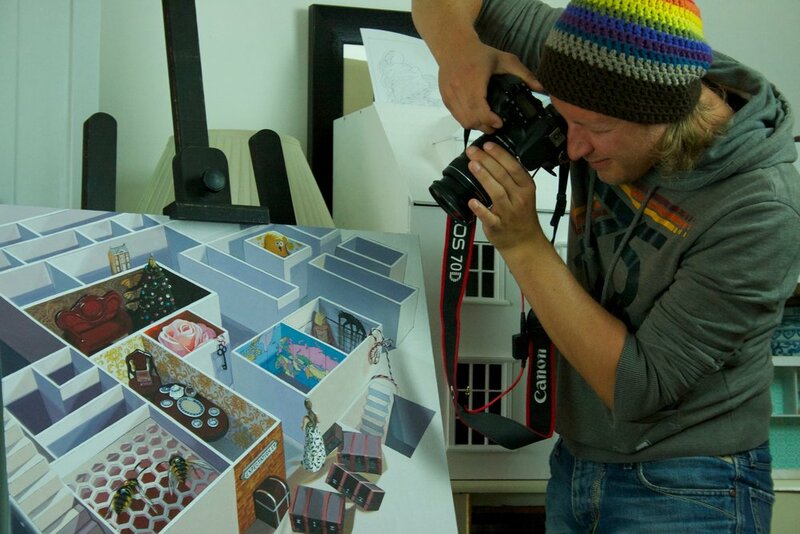 Mathias Baumann photographing the finished painting. In October 2013 I attended a bootcamp for artists, a four day workshop hosted by the Centre for Creative Practices and presented by the New York Foundation for the Arts. The attendees covered a wide spectrum of creative disciplines including the visual arts, printmakers, sculptors, film makers, live performance artists, musicians, writers and actors. Based on the premise that artists are great at what they do but fall short on the business side of their practice, we were advised about bookkeeping, taxes, copyright law, branding, marketing and submitting applications for funding and exhibitions. After the course, 27 of us formed a multicultural-interdisciplinary arts collective called 'idir', the Irish for 'between us', with a view to pooling our skills and resources and creating opportunities for ourselves. In January 2014 we secured a four month exhibition in New York with the New York Foundation for the Arts and funding from Culture Ireland. While very hard work, it proved to be a great success with performances on the opening night from idir artists and a special guest performance by Hozier. Subsequently, managing such a large group proved to be too difficult to sustain and idir disbanded in March 2015. Brian Horgan, Sinéad Cullen and Frances Mezzetti's live performance at idir's pop up exhibition, The Innovation Academy, Trinity. A long time friend Colin Eyre (Monoglow) and myself played together in various bands and have continued to collaborate musically over the years. When Colin saw the work I was making for my solo show 'One Need Not Be A Chamber to be Haunted', it inspired him to write 'The Dolls Suite', a collection of eight instrumental tracks. My particular favourite is 'The Doll Collector' which was based on my painting 'The Counsellor'. It is such a compliment to have another artist respond to my work in this way and I look forward to more collaborative projects to come. Musical response to 'The Counsellor' by musician Monoglow.